Since September it’s just gotten colder and colder. There’s less daylight now, I’ve noticed too. This can only mean one thing – the sun is going out. In a few more months the Earth will be a dark and lifeless ball of ice. Dad says the sun isn't going out. He says its colder because the earth’s orbit is taking us farther from the sun. He says winter will be here soon. Isn’t it sad how some people’s grip on their lives is so precarious that they’ll embrace any preposterous delusion rather than face an occasional bleak truth? => However, an e-mail message from my friend Eugene Matusov (which I quote with his permission) reminds me that I should have added a significant caveat. Eugene is a socio-cultural psychologist, originally from the former Evil Empire, who is now at the School of Education of the University of Delaware. But he was once a physics teacher. 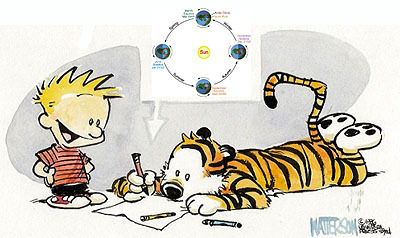 And he can't resist pointing out that the scientific explanation for the cycle of the seasons offered by Calvin's father is, in fact, erroneous. As a former physics teacher I can’t let pass the following misconception, “Dad says the sun isn't going out. He says its colder because the earth’s orbit is taking us farther from the sun. He says winter will be here soon.” It is clear that the dad “forgot” that the Southern hemisphere experiences spring in September as it gets more light from the sun. It cannot be true that for the Northern hemisphere the earth is moving farther from the sun in its orbit at the same time that, for the Southern hemisphere, the earth is moving closer to the sun. Something is missing in this explanation. It is interesting that the great majority of my undergraduate students, future teachers, reason like the dad. They often use seasons as an example of a scientific fact that they know well and can easily explain, but they get the explanation wrong. The earth's orbit around the sun is somewhat elliptical, not perfectly circular, so our distance from the sun does vary slightly during the year. But that's not what causes the change of seasons. The real explanation is a little more complicated. It has to do with the fact that the axis of the earth's own rotation is tilted at an angle with respect to the sun, and the tilt of this axis remains constant as the earth goes around the sun each year. So the part of the earth tilted toward the sun changes over time. When the northern hemisphere is tilted toward the sun it gets warmer, when it's tilted away from the sun it gets colder, and vice-versa for the southern hemisphere. If you're interested, the process is nicely illustrated here. The misunderstanding of this point demonstrated by Calvin's dad seems to be widely shared. For a 1987 documentary film on science teaching cited by Michael O'Hare, the film-makers went to a Harvard graduation and asked 23 randomly selected graduating seniors, faculty, and alumni why we have seasons; 21 out of 23 gave the same superficially-plausible-but-obviously-incorrect answer as Calvin's dad. => All this suggests some interesting lessons ... which I will mostly leave to readers to draw for themselves. But here are a few offhand remarks. One of Piaget's seminal insights early in his career was that if we want to understand how people think, we can sometimes learn as much from analyzing common errors as from analyzing correct answers. I think that's true in this case. There are certain errors and misconceptions we can expect to hear from uneducated people, but there are also certain errors and misconceptions that are especially characteristic of half-educated people. Unfortunately, even those of us who have accumulated many years of formal education tend to be half-educated, at most, in a lot of areas outside our specific fields of expertise. The blooper repeated by Calvin's father and those Harvard graduates looks like a typical example of a half-educated error. The premise for the explanation they offered was an underlying model of celestial reality in which the earth circles around the sun rather than the other way around. It's worth emphasizing that this astronomical model is not based on common-sense observation. On the contrary, it's a rather counter-intuitive abstract model which comes to us from "science," usually via formal schooling, and which we generally accept on the authority of "science". I suspect that most people in this society, if they think about the matter at all, accept this heliocentric model of the solar system as an established and taken-for-granted scientific "fact" (unlike, say, the theory of evolution, where epistemological resistance is stronger for ideological reasons). For what it's worth, I think we're right to accept it, and I am convinced that this theoretical model brings us closer to reality than simple common sense. The problem arises when such models, and other scientific "facts" we swallow in the course of our schooling, don't serve as a basis for thinking further but instead are used as a substitute for further thinking, or even a barrier to further thinking. So those half-baked ideas get repeated with confidence and self-satisfaction, but the confidence is misplaced. As I said, most of us are half-educated, at best, in many areas we don't deal with on a regular basis. (And, unfortunately, that holds true for a lot of the public issues we have to consider as citizens.) But anyone who has spent time in professional and/or academic circles, and has been paying attention, ought to be aware of another dirty little secret—namely, that many people who have picked up the standard training and credentials are, nevertheless, only half-educated in their alleged fields of expertise. A reliance on jargon and superficial formulas in place of actual thinking is often one sign of this condition, but far from the only sign. I'm sure that somewhere or other Calvin had something illuminating to say about this problem, too.